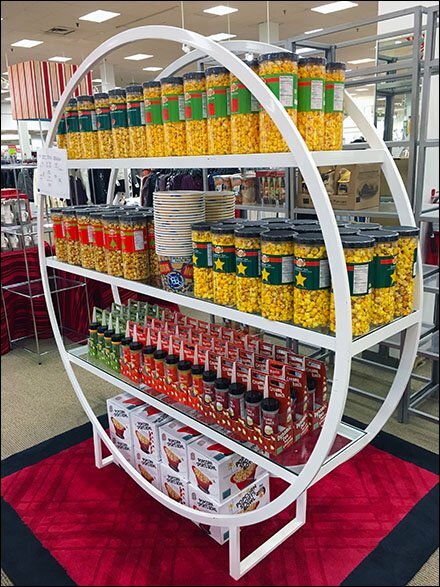 No other similar shelf units were seen in-store, which leads me to believe this Hoop-Shelf Hoopla for Gourmet Popcorn was the idea of the Popcorn Brand. 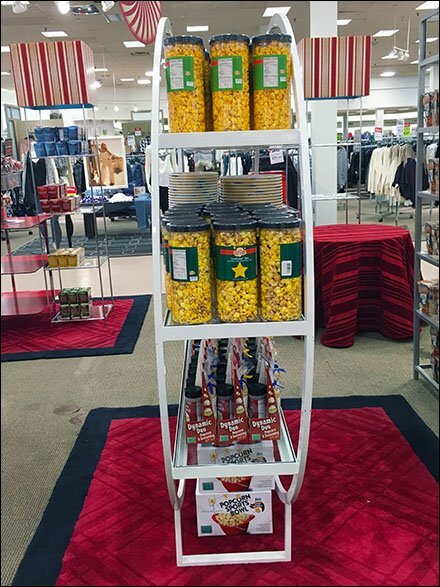 And if you are going to sell popcorn in a department store setting, maybe best that you stand out as much as possible like this while avoiding looking tacky or discount. Step through the Hoop-Shelf Hoopla for Gourmet Popcorn thumbnail and gallery of side and stepped views. My only comment was that product info and pricing info was provided by simple in-store 8-1/2 x 11 sign at the left. PreviousPrevious post:Drop-in Metal Label Holders for Bar HookNextNext post:What is the Lifetime Value of a Fixture Blog Post?